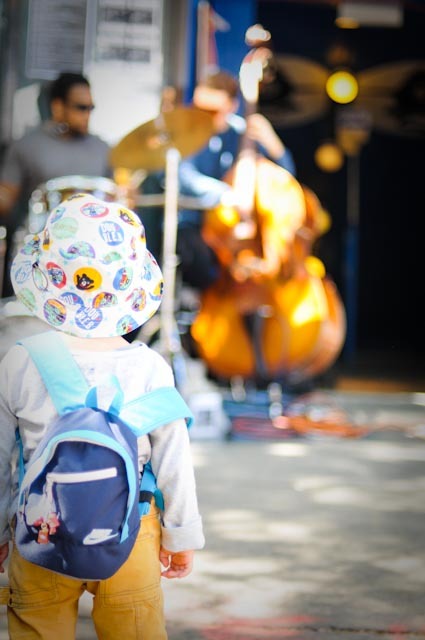 This cute little boy was totally entranced by this jazz band performing. The sounds of the cello, drums, and piano filled the air and drew a huge crowd. But this little boy with his intense amazement of the band is what got my attention. His mother (who was kneeling down next to him to his left) talked to him and touched him softly as he watched on. But he wouldn't take his eyes off of the jazz band as they played. He looks about 3 years old but the music almost seemed to hypnotize him, lol as funny as that may sound. I got down low to his level so that I could relate to what he was seeing from his perspective. His awesome yellow pants and colorful hat was so fitting. This is how things start with in us. The connection that this little boy made with the band, the music, and the instruments can be the start of his passion towards music; hey, you never know! That same fascination we have as kids doesn't die when we become adults. Some of us just choose not to express it as much or acknowledge that it even exists. Let's take a trip and reminisce for a bit. What was your fascination as a kid? Do you remember the moment you totally connected with something or someone? How did you feel? Keep dreaming and don't be afraid to bring those dreams to life!